The Federal's always been a great place to grab a lamb burger and a beer, but this Sunday, for one night only, it's turning into the best place to grab unlimited pork, brisket, Scotch, beer, cigars, and glimpses of girls from Wonderland, as your body turns into not-one. The non-stop, sit-down affair includes: Food: As long as you keep asking, they'll keep bringing family-style smoked pork shank, KC-glazed pig wings (So... they're flying now? So much crazy stuff must be happening! ), St. Louis-style ribs, and signature octopus and chicken liver pate apps by Tudor House's Jamie DeRosa, plus Texas cowboy brisket, Bobo’s fried chicken, and "ginormous" grilled shrimp. Drinks: Local distributor Vinecraft's popping up a single malt-loaded whiskey bar, while the Fed'll have pitchers of their homemade Spring Fling punch (red wine, muddled thyme, strawberry peach puree, fresh orange slices) plus buckets of craft brews like Old Chub and White Rascal. 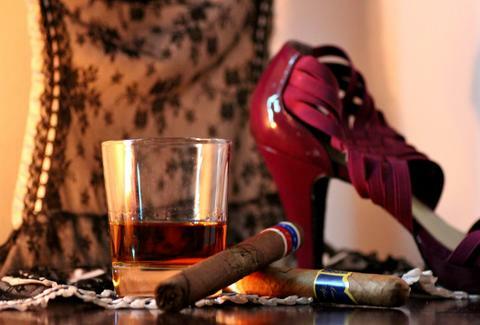 Additional Saucy Action: Aside from a local blues band, Sosa Cigars'll be rolling up stogies. But forget all that for a second, because there'll also be... strippers! Yep, they've brought in the gals from gents' club Wonderland for some entertainment, the nature of which is currently under wraps, hopefully unlike the girls themselves.